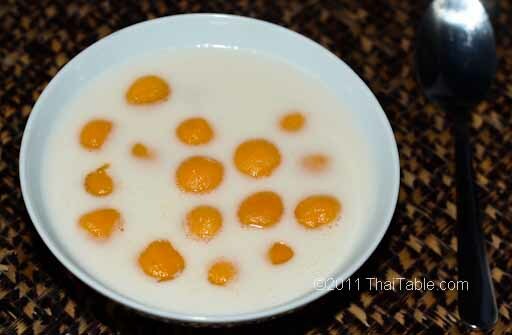 Pumpkin sticky rice balls in coconut milk known in Thailand as Bua Loy, is a dessert that is simple to make and a perfect way to use up pumpkin after Thanksgiving. Great bua loy is chewy yet soft with sweet coconut sauce that’s not overly sweet. 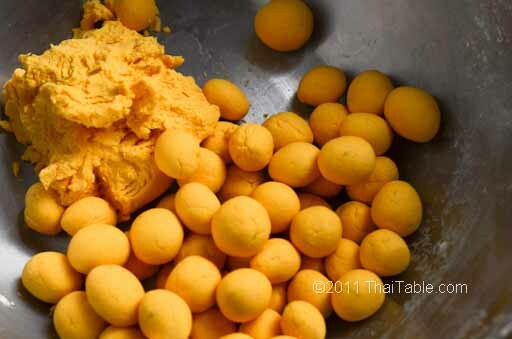 In Thailand, there are many flavors and colors of bua loy. The popular ones are pandan, pumpkin, taro and blue pea flower. Besides the different colors, you can crack and poach an egg in the coconut milk. This type of bua loy is called bua loy kai waan. Keep in mind when the coconut sauce is warm/hot, it doesn’t taste as sweet. When it cools down, the sweet taste is more prominent. Adjust the sugar accordingly. You can also dilute it with water if it is too sweet. You can substitute sugar for palm sugar. 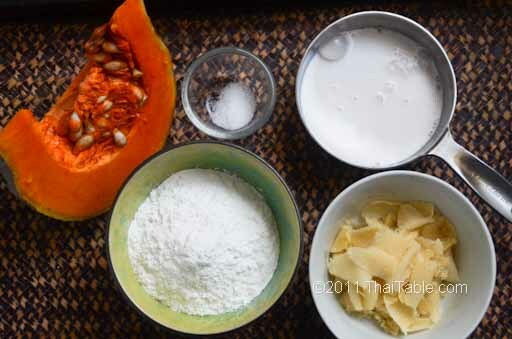 Pureeing: If you are using fresh pumpkin, remove the skin and seeds from the pumpkin. Cut it into smaller pieces for faster cooking. Steam pumpkin for 15 minutes or until soft. Test for doneness with fork. The fork should go through pumpkin easily (similar to cooked potato). Puree the pumpkin in a food processor to get the smooth texture. The ratio of pureed pumpkin to flour is 1 to 2, give and take. Start to boil a pot of water to cook the pumpkin balls. While water is heating, make the dough. 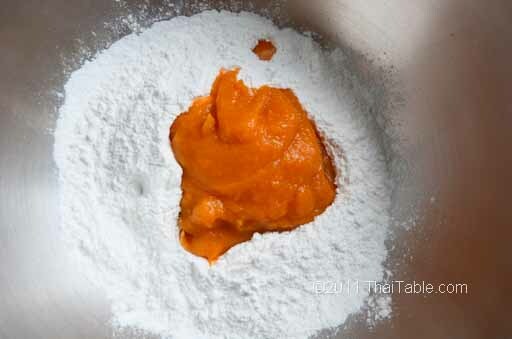 Add pureed pumpkin to flour. Knead until well mixed. The dough should be soft but not too soft. 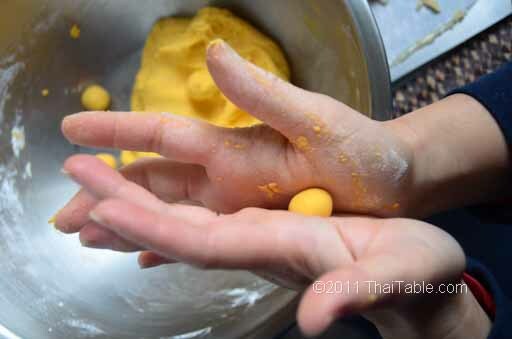 Pinch a small amount of the dough and roll it between your palms to form a ball. The ball should be easy to roll and keep its shape. 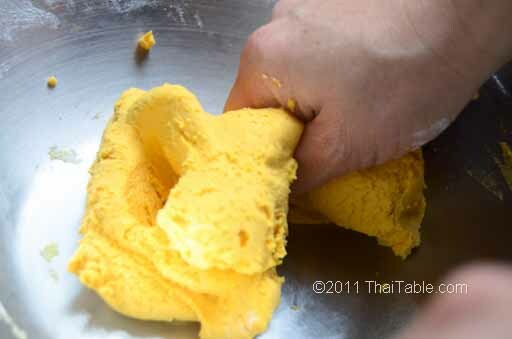 If the ball has cracks that you can’t roll out, your dough is too dry, add more pureed pumpkin. Each ball should be about the size of your thumb. When I was a kid, I had a lot of fun designing and making the weirdest shapes I could think of. Test for the chewiness: drop a ball in boiling water. When it floats up, strain it out from the water. Run the ball under cold water and taste. It should be chewy. If your ball is too soft, add a teaspoon of flour to the dough, knead again. Repeat the test again until you get the right chewiness. When you are happy with your dough, roll them into balls. Pour all the sticky rice balls into the boiling water. The cooked ones will float up. 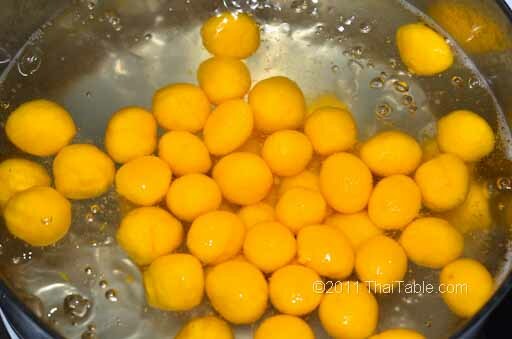 Strain the cooked balls from water and set them aside. 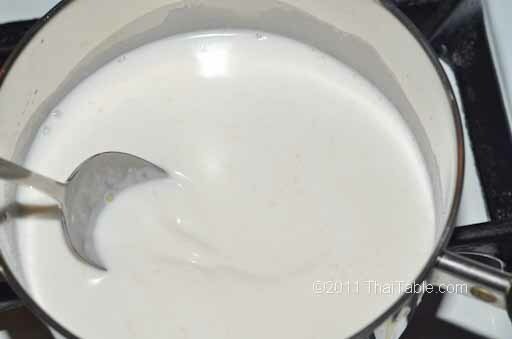 Preparing the coconut milk sauce: add coconut milk, salt and palm sugar into a pot over low heat. Stir until the sugar is dissolved. If you have a pandan leaf, cut into 3 inch pieces and crumble them into the sauce. You want the pandan flavor, not the color. The sauce should be sweet but not overly sweet. 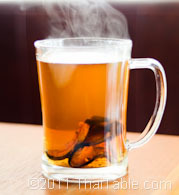 If you feel that it needs more sweet, add cane sugar because it is easier to add in small amount to adjust the flavor. Taste the sauce again. Keep stirring to prevent coconut milk from curdling. If you are happy with it, let it come to a simmer and turn off the heat. Making the sauce should not take more than 3 minutes. Add the sticky rice balls into the coconut milk sauce. Serve hot or warm. The taste: The pumpkin sticky rice balls should be sweet with pumpkin flavor. The coconut sauce should be sweet with a distinct palm sugar flavor that is different than cane sugar. Together, you should taste the chewiness of the balls with a hint of sweet from the pumpkin and sweet sauce with distinct palm sugar sweet with creamy flavor of coconut milk. With the pandan leaf in the sauce, the leaf's fragrance brings in another dimension.